I must admit: before I started my Viniyoga teacher training, I’ve never heard of sacrum issues. Sure, I knew what the sacrum was, but my first yoga teacher training program never talked about it, my students never complained about it, I haven’t had any trouble myself. So I’ve moved through life blissfully unaware, until I started my Viniyoga teacher training. Then all of the sudden the sacrum became front and center. I would hear “this pose can be problematic if you have sacrum issues,” “do this to take care of your sacrum,” “make sure you don’t feel any discomfort in your sacrum,” etc. You know how when you decide to buy a certain car you start seeing it everywhere? Same happened for me with the sacrum. All of the sudden I’ve discovered that sacrum issues are everywhere and certain yoga practices often create or contribute to the problem. Well, to be more specific, it’s not really the sacrum that we have issues with, but the sacroiliac (SI) joints. Quick anatomy reminder: the sacrum is located at the base of your spine and consists of five vertebrae that are fused together to form a bone about the size of your hand. It fits snuggly between the two sides of your pelvis and is connected to them via the sacroiliac joints. 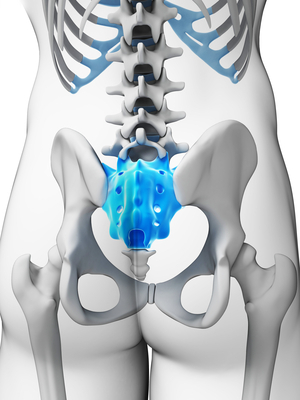 SI joints are weight-bearing because the sacrum bears the weight of the spine and transfers it through those joints to the pelvis and then down into the legs. Like any weight-bearing joint, it needs to be stable, so there are several ligaments that bind the sacrum to the pelvis to restrict its movement. Now some of us have more mobility in the sacrum than others and that’s what can create potential problems. The sacrum has an ability to tip slightly forward in relation to pelvis (called nutation) or slightly back (counternutation). It can tip five to ten percent at most, but even that can create the sense of instability in the pelvic area. People with loose ligaments. Some of us were born with looser ligaments, which enables us to do more advanced yoga poses, but also puts us at risk for SI issues because of extra sacrum mobility. The problem. So that young uber-flexible girl in your yoga class, who is happily trying to stick her foot behind her head runs the risk of pulling or injuring her SI ligaments. Her sacrum is more likely to pop out of place, usually on one side, and once it’s out of place it will pull on the ligaments that are supposed to keep it in place, causing sharp pain on one side of her lower spine. And as we know, ligaments are highly avascular, which means that if there is a tear in a ligament, it will take a long time to heal because of poor circulation to the area. Unfortunately, once you injure the area, you are likely to reinjure it again, especially if your practice emphasizes extreme poses and you ignore your body’s pain signals. We say that a student has a “hot sacrum” if her SI joints are sensitive and prone to injury. Folks like that will have to modify their yoga practice dramatically while they are in the healing stage, otherwise they will keep reinjuring it and turn it into a chronic problem. Now what can we, as yoga teachers, do to minimize the risk of the sacroiliac injury? This entire sequence was done on one side first, holding each pose for 4-6 breaths, without any queuing about changing the position of the feet or using abdominal contraction for support. Do you see a problem here? The position of your left leg is fixed, which means that the left side of the pelvis will be anchored in mostly forward-facing position. Then you move your spine through a side bend, forward bend, backbend, side bend and then twist. Your sacrum follows the movement of your spine, tugging and twisting and torquing your left SI joint. 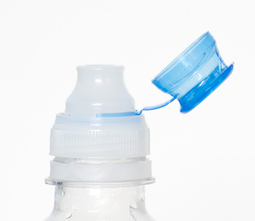 This reminds me of trying to pull off the top of a plastic bottle – to break the thin piece of plastic you would bend it forward, bend it back, twist it one way, then the other and hopefully it will come loose after that. Why would you want to do that to your SI ligaments? They won’t break off, of course, but they will get destabilized and become more vulnerable and susceptible to injury. 4. When you sequence your classes, be sure to include poses that stabilize the sacrum. In the traditional approach to sequencing summarized by Sri Krishnamacharya, prone backbends always follow the standing postures to make sure that whatever you have done to your lower back/sacrum area in standing could be neutralized via symmetrical prone poses. You may also be interested in our online course with Dr. Loren Fishman and Ellen Saltonstall: Yoga for Back Pain: Keys to Safely Preventing and Relieving Back Pain. Educated as a school teacher, Olga Kabel has been teaching yoga for over 15 years. She completed multiple Yoga Teacher Training Programs, but discovered the strongest connection to the Krishnamacharya/ T.K.V. Desikachar lineage. She had studied with Gary Kraftsow and American Viniyoga Institute (2004-2006) and received her Viniyoga Teacher diploma in July 2006 becoming an AVI-certified Yoga Therapist in April 2011. 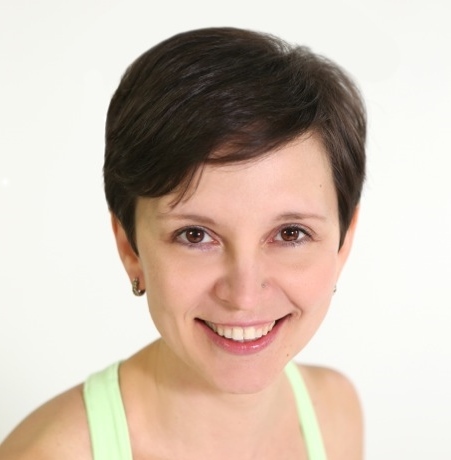 Olga is a founder and managing director of Sequence Wiz - a web-based yoga sequence builder that assists yoga teachers and yoga therapists in creating and organizing yoga practices. It also features simple, informational articles on how to sequence yoga practices for maximum effectiveness. Reprinted with permission from SequenceWiz.